Bowl and Beer for just £14.00 per person - 2 games of bowling, 3 selective drinks - Friday to Sunday from 6pm. Bowl for just £8.95 per person on Friday night (with Cosmic bowling) or Saturday night (minimum 3 people per group). 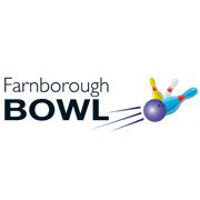 Farnborough Bowl offers an exciting bowling extravaganza for your child and their friends. We turn your children’s party into an exciting day to remember, entertaining your children and their friends ensuring they have a fun party. Our STRIKE, Tenpin Bowling Parties are aimed at children aged between 5 - 12 years. All parties will be under our fantastic "Cosmic Lights", with barriers up or down, its your choice. STRIKE parties include 1 hour of bowling and 45 minutes in our party room for food. STRIKE parties are available at selected times on Fridays, Saturdays, Sundays and Mondays. Minimum of 12 children, maximum 18 children. *Party hosts cannot be responsible for the children at any time. Dance the night away with our Adult party packages for friends, corporate and groups. We offer amazing adult group rates. Let us do the organising and tidy up too! There are no hidden charges; Shoe Hire and Admission are included in all our prices. For your amusement why not visit our games area and try our Pool Tables, Air Hockey or Arcade Games.